Don't ruin a child's first fishing experience. 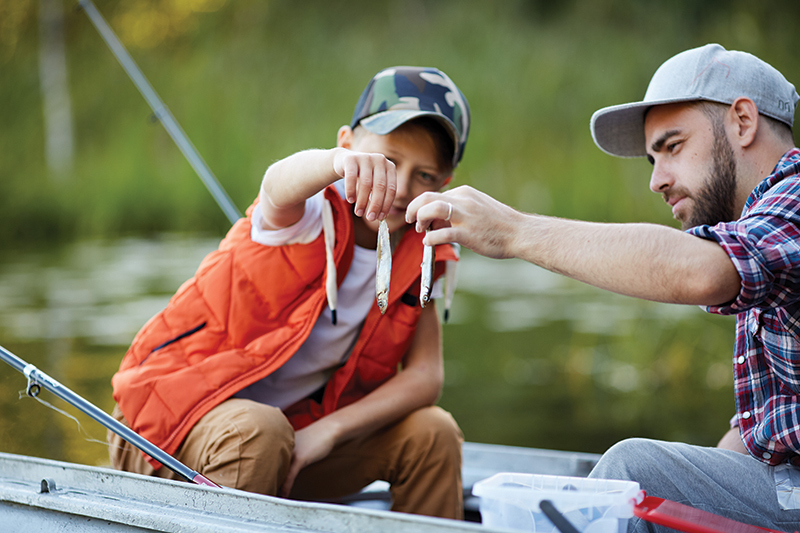 Teaching children to fish and creating a positive first experience not only ensures they want to partake of the activity again, it practically guarantees parents a lifelong fishing buddy. The first thing to remember is to leave your ego behind. Showing children what a stud angler you are helps nobody. And remember, whether you plan to fish from a boat, a dock or the edge of a pond, be sure every child wears a life jacket. 1 For the first outing, scale the tackle to the children’s level. My son caught his first fish on a Popeil Pocket Fisherman and was thrilled. My daughter had a Barbie rig. Maybe you wouldn’t dream of using a spin-caster, but they’re great for kids to use while they learn, and honestly, the fish don’t know the difference. 2 Introduce your new anglers to your local tackle shop and its staff. Explain what questions to ask to help make your fishing adventure more productive. Ask about the best bait and lures, places to go, best times of day or preferred tides (and why). The question about places to go is important, because you need to hit a fishing site where fish are likely to be found. Children quickly get bored scouting areas. 3 Let your helpers participate in pre-fishing organization: bait, tackle, food, sunscreen, hats, sunglasses, etc. Ask for their opinion on things to bring along. But let them know certain tasks are for the adults. Show children how sharp the hooks are and explain that’s the reason you’ll be tying the knots and handling the hooks. Pinching down the barbs can be an invaluable precaution if a hooking incident occurs. 4 Carry out pre-fishing simulations. Show them how to cast in the yard with a rubber weight on the line. That way they have a comfort level when it’s time to fish. Hold the end of the line and tug on it to show the children what it will feel like when a fish strikes. Then explain what they need to do to hook and fight the fish. Explain why they shouldn’t reel against the fish when it’s taking line. Understand that what you have been doing for many years is totally new to children. 5 Even something as simple as holding the rod can be a challenge for them. Show them the most effective range of motion for the rod while fighting the fish and the easiest way to reel. Be patient when they don’t catch on right away or if they handle things in a clumsy fashion. Finesse takes time and practice. How many bird’s nests have you created? 6 Children seem to have less difficulty with sidearm casts than overhead ones. Sidearm casts are also safer for nearby anglers. Explain the process slowly and carefully, starting with the need to check all around them to make sure nobody is in the way. Be sure to add lots of encouragement. Don’t let yourself get frustrated, or the children will want to quit. 7 Explain how to bait the hook for the particular application and why you do it that way. Then show them the most effective retrieve for that rig. Don’t do it for them; help them as they do it. 8 Before they ever catch a fish, explain what they should expect. Show them how to gently bring it to the surface. Will it be netted, just lifted or gaffed? Where should they stand, what should they do with the rod and reel? Show them how to safely and gently release a fish properly. Most children don’t like handling slimy, wiggling fish at first. Giving them a small, lightweight dehooker is a great way to eliminate that reticence and at the same time promote safe and proper release techniques without handling the fish. 9 Will you be keeping the fish for dinner? Don’t forget to share the importance of only keeping what you need and being a responsible resource caretaker. 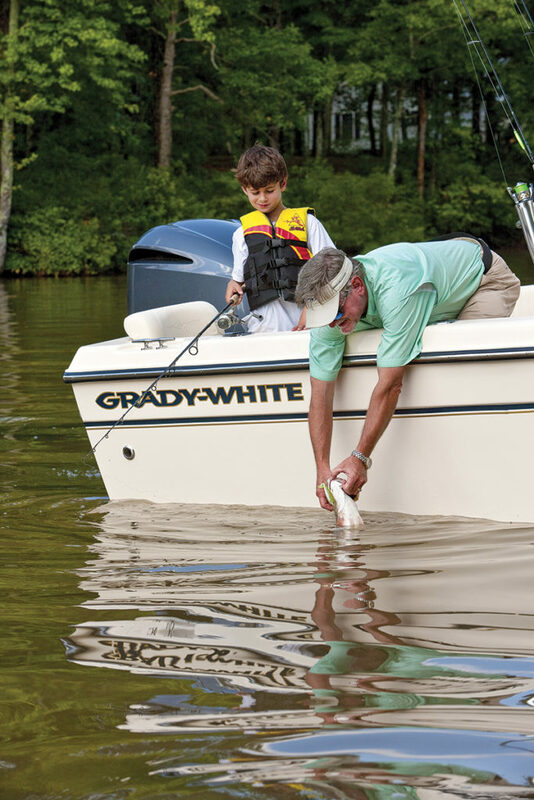 Teaching children to fish, and go boating in general, for that matter, has other terrific benefits. It’s a great equalizer. You’ll find that you can talk about all sorts of life subjects while you’re together fishing. You won’t find a better bonding opportunity. Feeling really organized, altruistic and energetic? Maybe you can organize a fishing tournament for kids. I did it years ago, and it wasn’t very difficult. Fish and Wildlife scientists stretched a net with floats on the water, forming a semicircle about 100 yards long and extending some 200 feet from shore at its max radius. The next morning a large tanker truck backed up to the sea wall and dumped hundreds of juvenile red drum from the state hatchery into the penned area. The next morning lots of kids (and parents, grandparents, civic groups and school classes) showed up; some had fishing poles but most didn’t. The local sporting goods chain helped sponsor the event and donated inexpensive rods, reels, line, tackle and prizes, as well as staff to help instruct the kids. Each fish had been tagged at the hatchery. When a child caught a fish, one of the volunteers quickly filled out a form with the child’s name and the fish’s size and tag number. Each child then received a frame-worthy certificate that commemorated the event. When the festivities were finished, the biologists pulled the net and the fish joined the environment, no worse for wear. After that day, anytime someone reported one of those tagged fish being caught again, the child who initially caught it got a notice in the mail with pertinent details such as when and where it was caught and how much it had grown.